I am not sure if you guys feel the same, but I get pretty excited to share a new “Beautiful Homes of Instagram” every week here. It’s wonderful to see the process of each and every post. 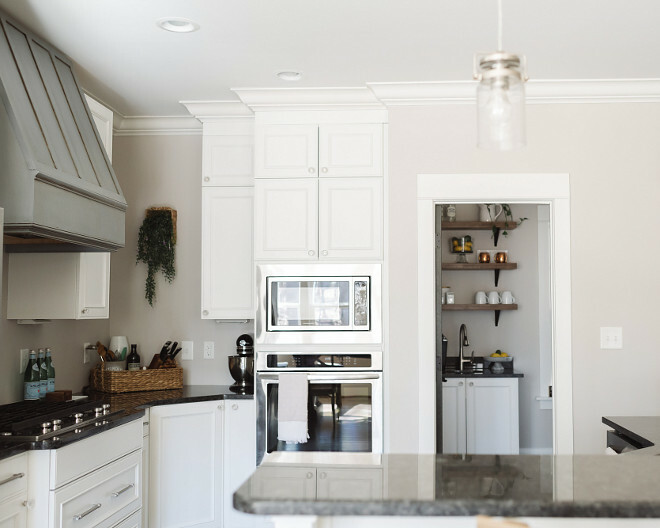 I not only have to approach and talk to each homeowner, but they also need to prepare their home for the photos, get all of the information together and send it to me. I then gather all of the details and share them here, on Home Bunch. It’s not a very simple nor a fast process. Most of these homeowners do all of the job themselves and I have to mention how grateful and honored I am to introduce these talented people. They truly deserve our gratitude! Today, this “Beautiful Homes of Instagram” feels extra special to me. Abbie, from The Gray Cottage, is someone I wish lived next door to me. Do you know those people you talk for a few minutes and feel as if you knew the person for a long time? Abbie is warm, sweet and very smart. 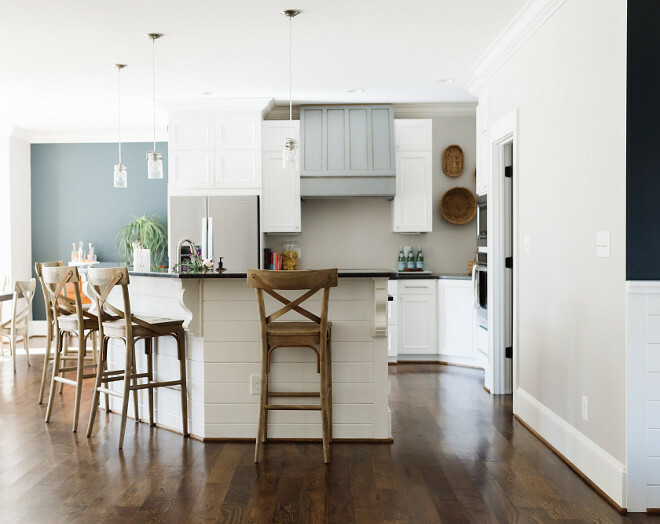 Here you will not only see how she and her husband built this home but also how they incorporate their own style to each space. Trust me, we’re lucky to have Abbie here and you will love getting to know her as much as I did! Hello y’all! 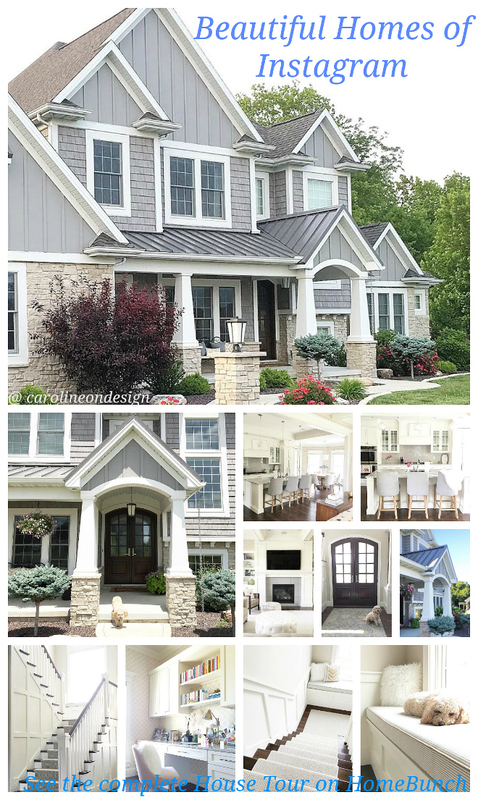 My name is Abbie and our home is known as “The Gray Cottage.” My jaw dropped when Luciane asked to feature our home – what an incredible treat to be featured along side these gorgeous homes. Luciane creates a place where amazing design inspiration is showcased. She is such a darling person. I can’t thank her enough for this opportunity. 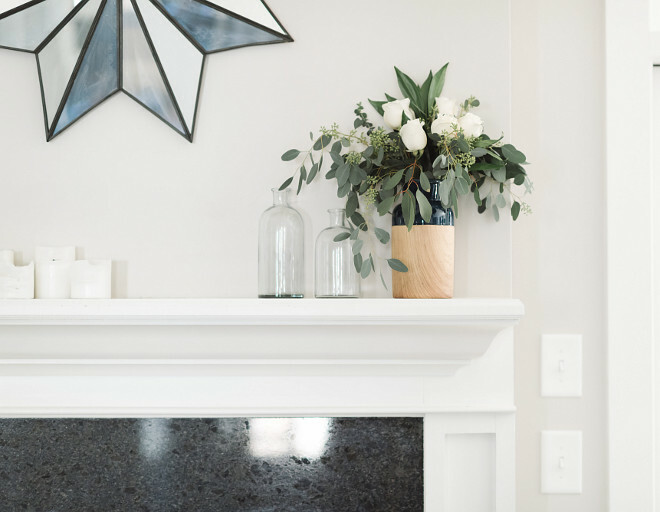 *Honest moment here* – I was so close to backing out because the exterior of our home is far from finished and I felt completely intimidated by our home being featured along side some truly perfect homes. Luciane is incredible because she put my fears at ease and encouraged us to be real with people. The single word I would use to describe our home is “grace”. It is a gift we truly do not deserve. There are days when we still don’t believe that this home is ours. While we were building our home, we invited our family and friends over to write prayers and verses on the studs of our home. We wanted to make sure our home was built on a firm foundation, without it, none of this matters. My husband and I are just two average people who both work and built a home with a very real budget. I hope you enjoy our home tour and can feel the love and care we put in to making our home. My husband, Jon, and I have a boxer named Bronx. We work together at my family’s company designing libraries and furniture for schools across the country. He is the marketing director and I am a project manager. I could have never tackled this house build without Jon. There were a lot of moments that drew us closer as a couple and I am forever grateful. 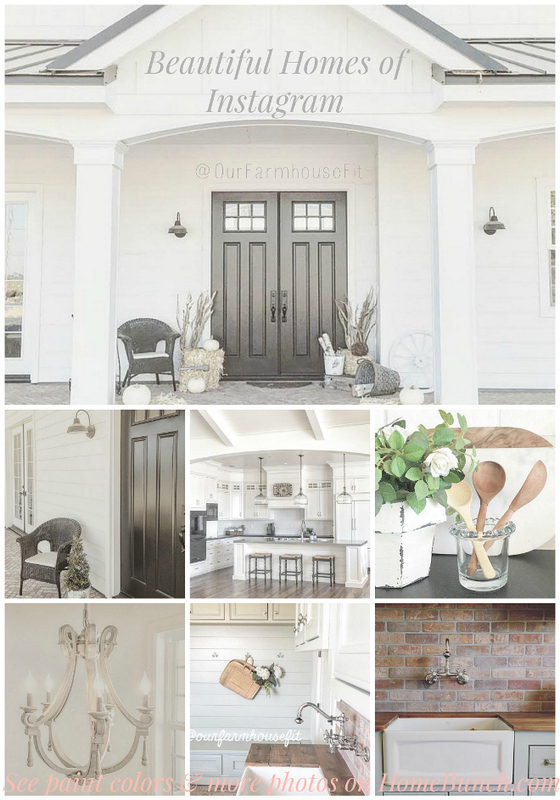 In terms of architectural styles, I would characterize our home as a craftsman style with farmhouse and cottage touches. It is uniquely ours. Since we don’t live in a neighborhood, we wanted to keep in line with several of the nearby homes, to make sure it would have good resell value, if we ever went that route. This is our forever home so we certainly don’t have any plans of that happening. We worked with a local architect (“K & A Home Designs Inc.) to create our floor plan. Our contractor was “Atkins Building and Remodeling”. They worked in tandem to bring our vision to life. It is a very open concept home. Our main floor is 2400 square feet and we left the entire upstairs unfinished and roughed in plumbing for future expansion. First floor has 3 bedrooms and 3 full baths. We used an I-beam to eliminate the need for columns in the living/kitchen/dining spaces. The bar height angled island sections off the kitchen, while keeping sight lines open. Double sets of french doors and transoms allow light to flood in from the screened porch. 3 large windows define the dining space while sharing light with the kitchen. Quick overview of the floorplan: center is living/kitchen/dining, to the left side of the house includes the owners suite to the back and the front is a bed/bath/closet area. The right side features another bed/bath, laundry/mudroom, garage, and staircase to the unfinished upstairs. 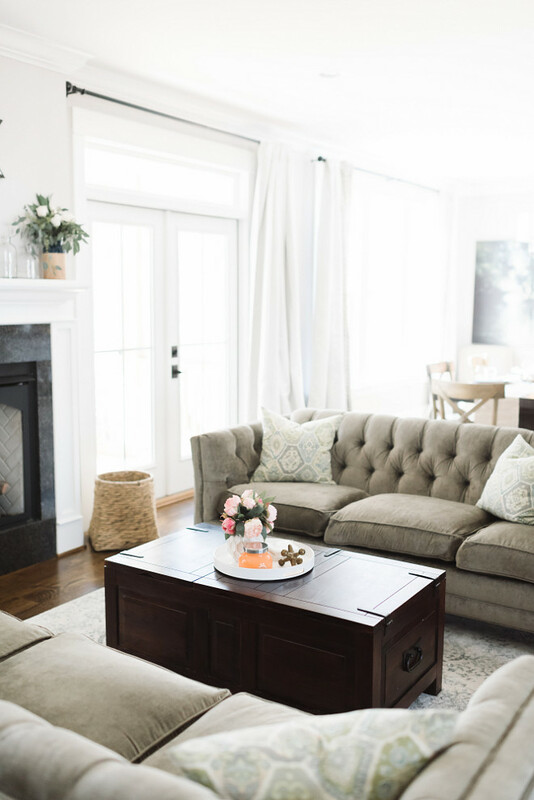 Our home decor style is best defined as a “contemporary cottage.” It is my desire to create a calming environment for us to relax in while we are at home. I love bringing plants, fresh produce, glass, and baskets in as textural elements. 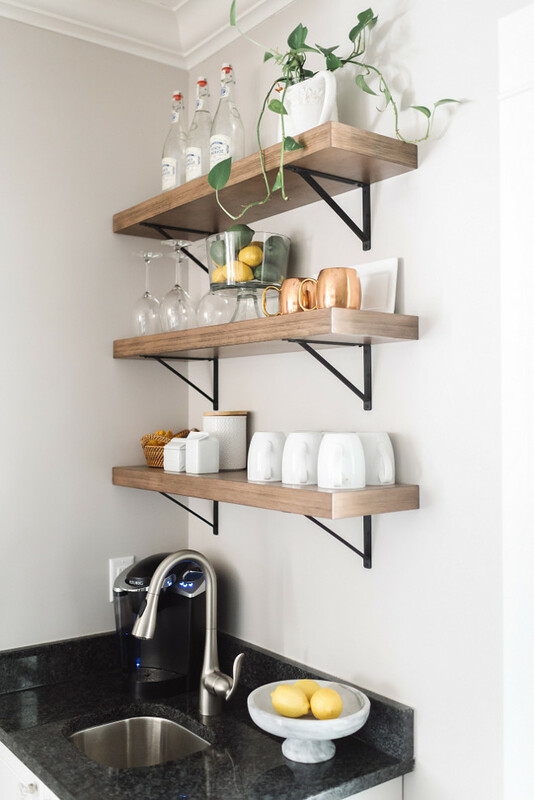 We prefer clean lines and simple decor. Melted candles are also a must. Our house is gray so it kind of named itself – hah! Our end goal is to make the house feel cozy and welcoming to all who enter. During the summer, our front porch has baskets filled with flowers that spill over the railing. The screened back porch is home to all kind of random plants that I decide to foster. (My plant collection contains a lot of crazy plants (see pictures for evidence). 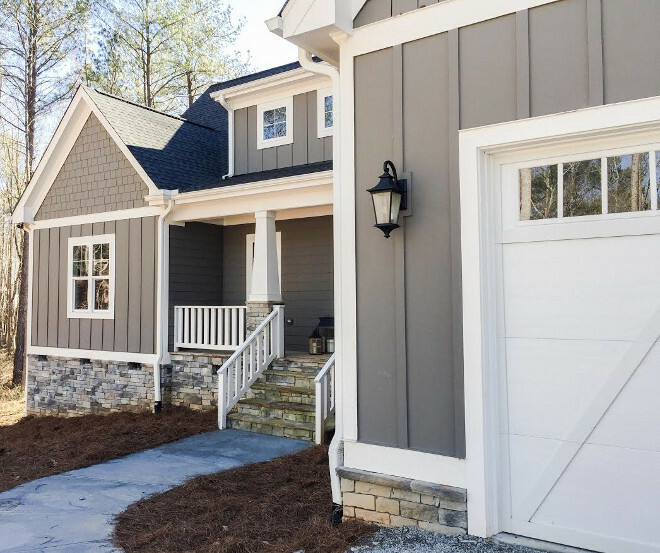 Grey Siding & White Trim Exterior Paint Color: Grey siding paint color is Gauntlet Gray Sherwin Williams and white trim paint color is Snowbound by Sherwin Williams. Door Handle: Emtek Assa Abloy. 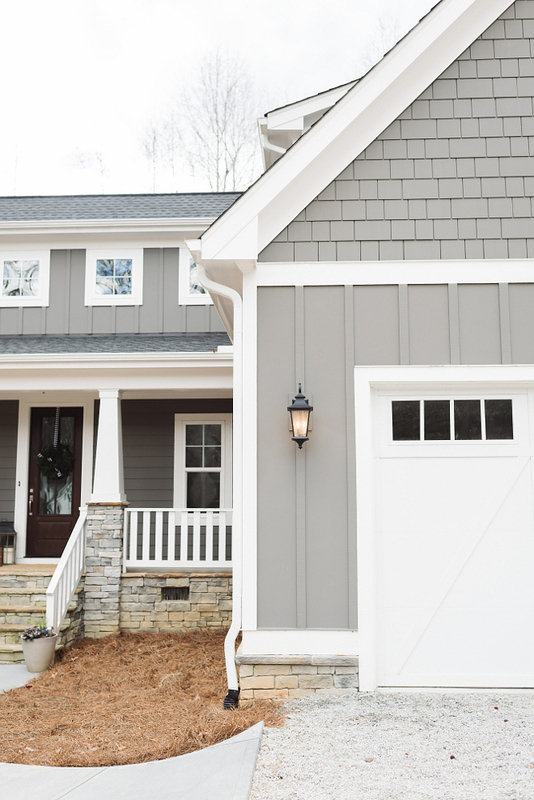 This is one of the best grey exterior paint colors in my opinion — it’s deep yet not too dark. When you step into our foyer, it opens directly into the living/kitchen/dining. Our pantry and office are directly to the right and left of the foyer walls. It’s a relatively small foyer and one side is slightly deeper to accommodate a table and benches. Still on the hunt for the perfect set. Since our home faces north, we used a door with windows to let light in. 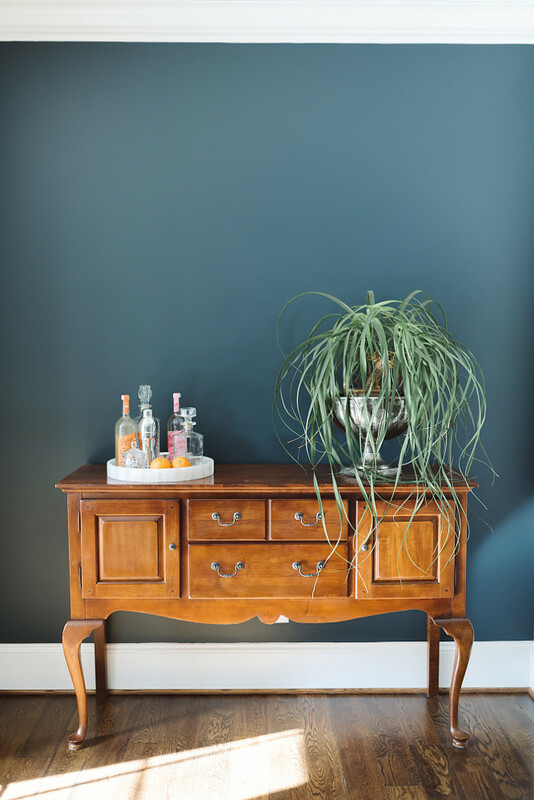 The tongue/groove planks set a more casual standard for our home, while the dark accent wall color dresses up the foyer ever so slightly. The wall paint color is Mount Etna SW7625 Sherwin Williams. Paneling is Sherwin Williams Snowbound. 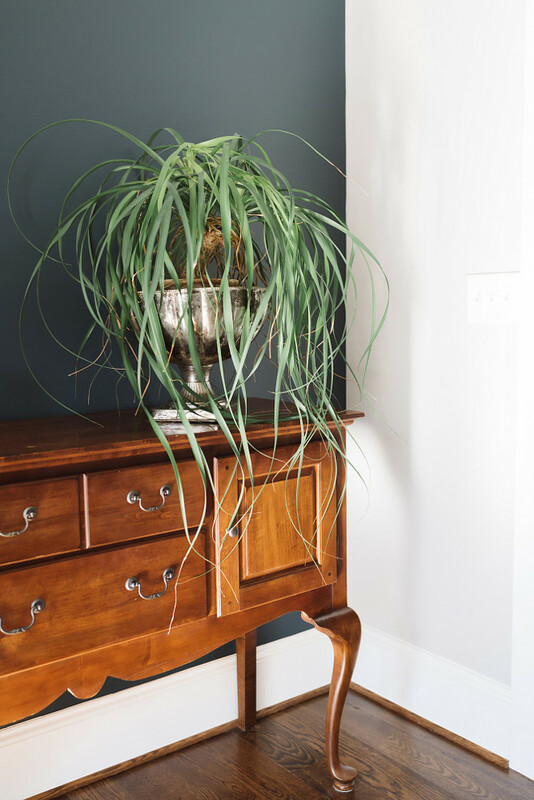 Interior Door Paint: Black Fox by Sherwin Williams. Fixture: Savoy House Penrose (Polished Nickel). Crystal Knob: Emtek Assa Abloy. I designed our kitchen from scratch using a company called “Decorative-Specialties”. NO prior experience and I learned a whole lot. My husband and I also built it…from scratch! Everything shipped to us flat and we put it together. Team building …am I right? Barstools: World Market French Bistro. My husband and dad built our vent hood as well. I painted the hood with Annie Sloan paint. A local friend/cabinet installer helped us set/hang the cabinetry. 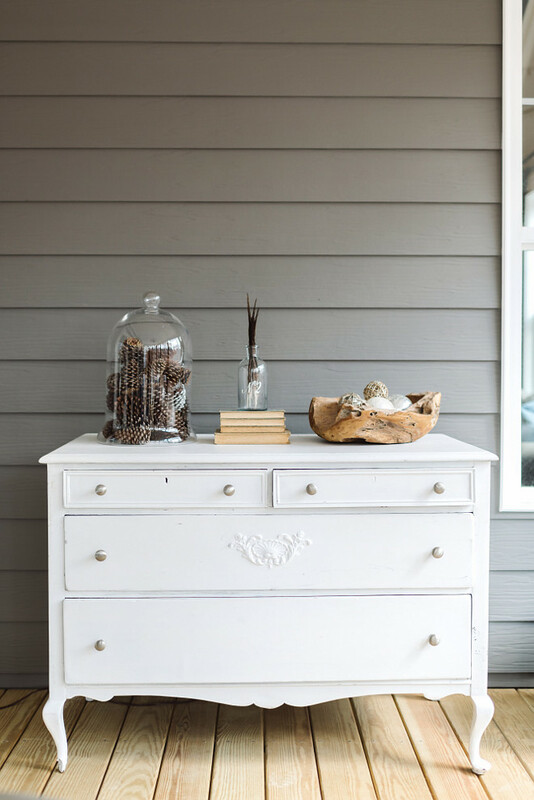 The paint color is Annie Sloan 50% Paris Gray / 50% graphite. 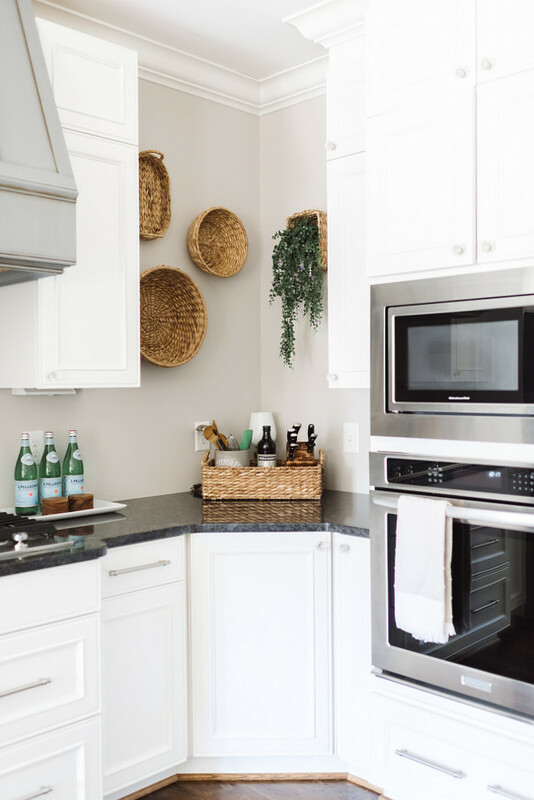 The kitchen features a 36″ Kitchenaid Gas cooktop. 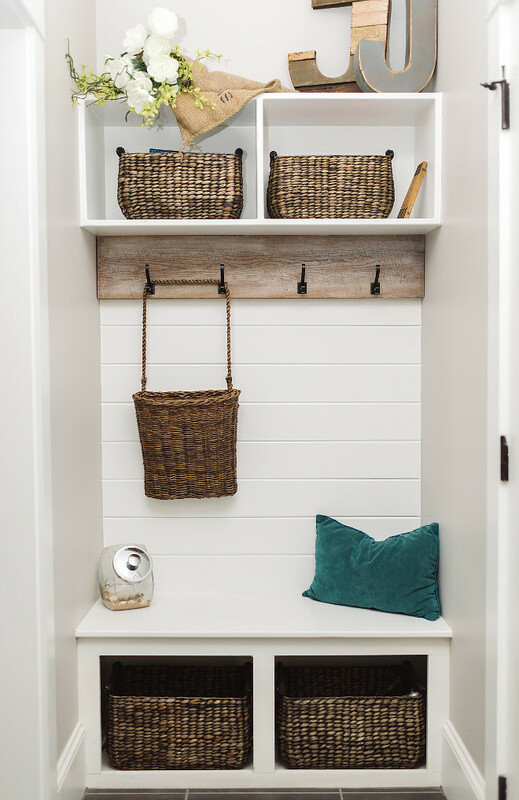 Wall Baskets: Michaels & Target. Salt & Pepper Cellars: Crate and Barrel. 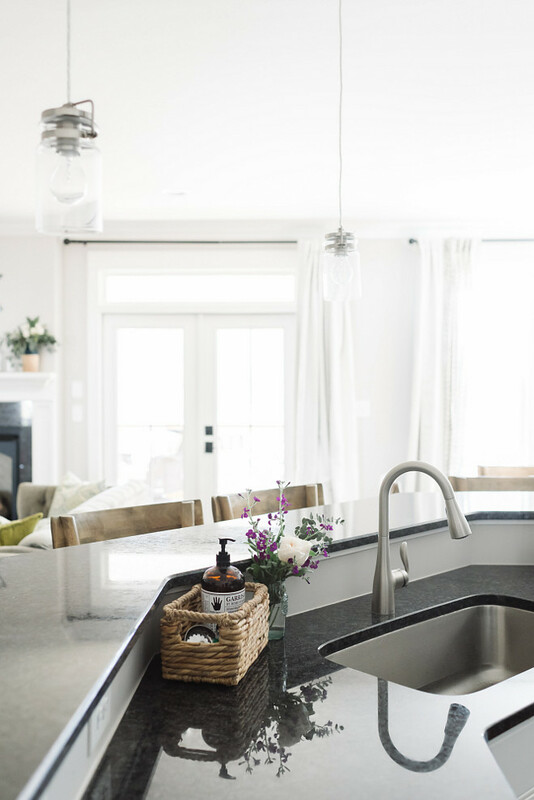 The island holds dual pull out wastecans, 30″wide stainless sink, and dishwasher. 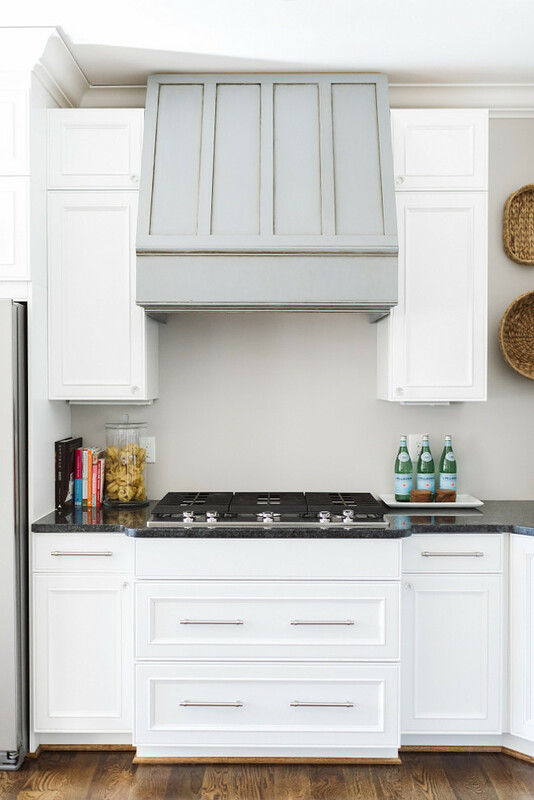 Natural maple cabinet interiors create a neutral backdrop. Cabinet paint color is Benjamin Moore Decorators White. Contertop is Polished Steel Gray granite. 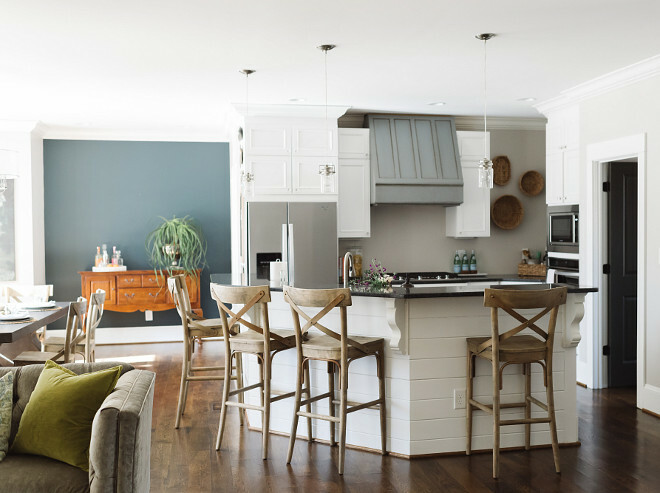 Island Pendants: Brinley Mini Pendant (Brushed Nickel). Simple and beautiful! I love how Abbie decorates a home. 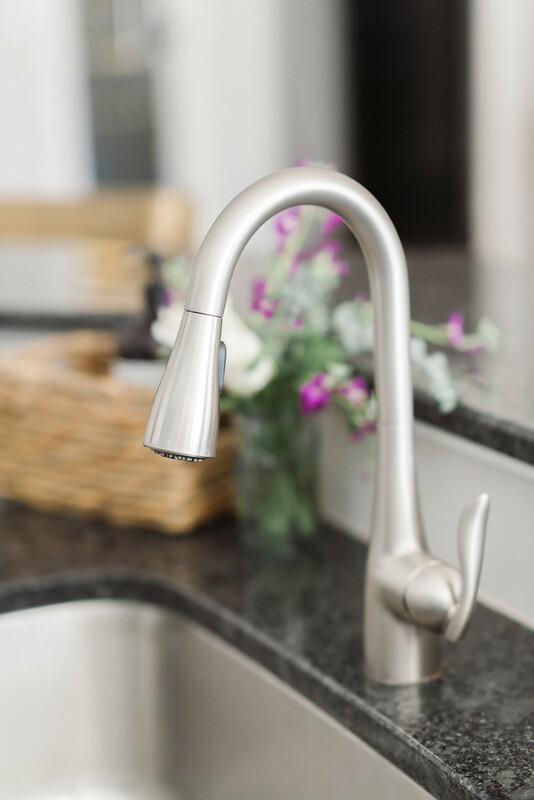 Kitchen faucet is Moen Arbor in Stainless. Our kitchen is packed with storage. 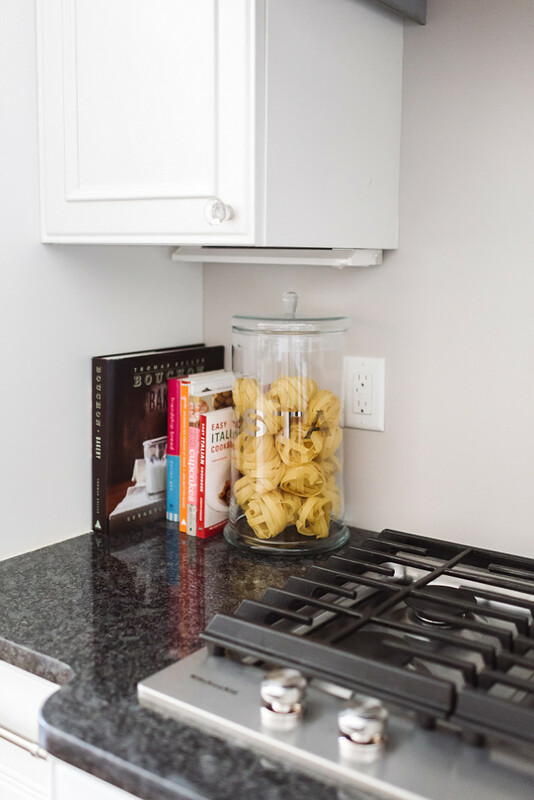 From the floor to ceiling cabinets to the pull out drawers in every base cabinet and the lazy-susan corner cabinet, I made sure there was a home for everything. I still have cabinets that are empty – hah. All doors have soft close hinges while the drawers also feature heavy duty soft close glides by Salice. Growing up my mom always had drawers under the cooktop in her kitchen for her large pots, so I wanted to carry that feature into our home. Kitchen Island: 13ft overall (island is angled and seats 4, we added tongue/groove planks to increase durability on front of island). 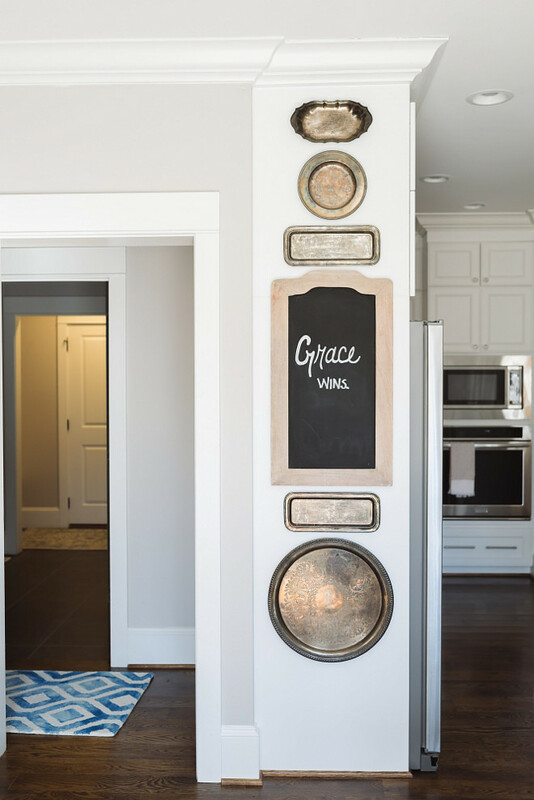 Vintage silver trays and a chalk message board brings a farmhouse feel to the kitchen. 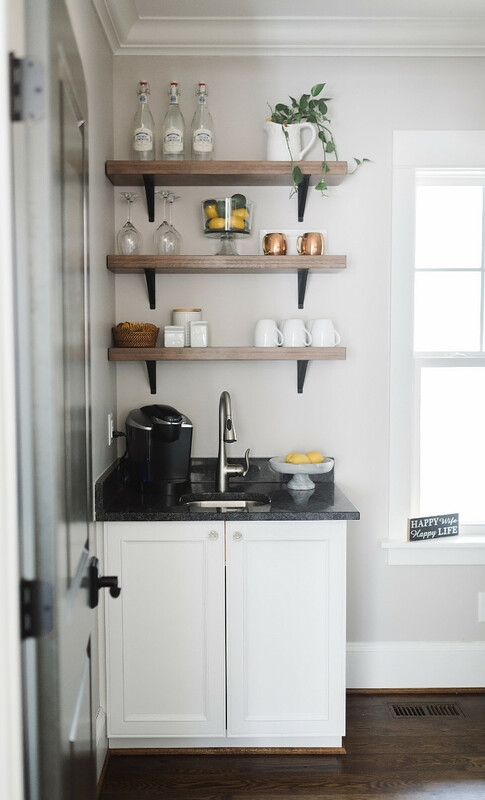 The pantry is one of my favorite elements – it stores everything, including a sink with coffee bar. 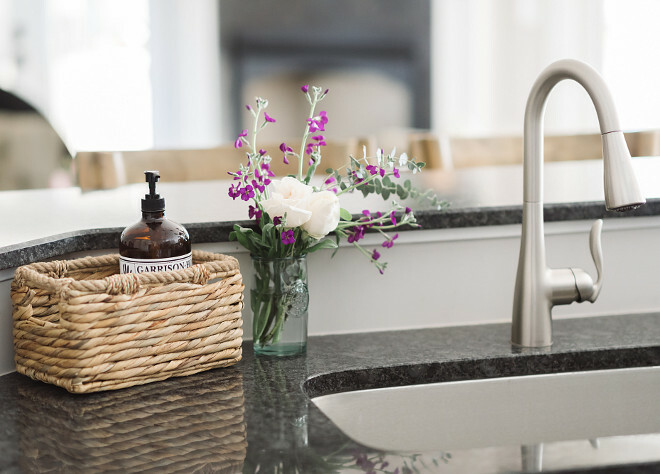 Faucet: Moen Arbor in Stainless. The wood shelves are from Lowe’s. We used chrome shelving to display our serving dishes and canvas baskets to house our food. I love that everything is on display, it gives the space a fun bakery feel. 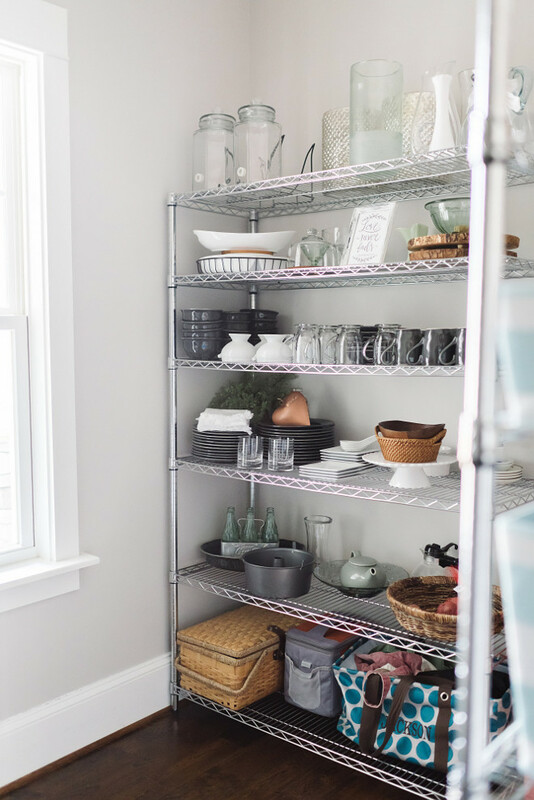 Chrome Baker’s Shelves: Home Depot. Since our main living areas are open to each other, I knew I had to use windows to define each space. The dining room features 3 large windows that let in copious amounts of light. There is also a niche that hosts an antique buffet and moody wall paint. 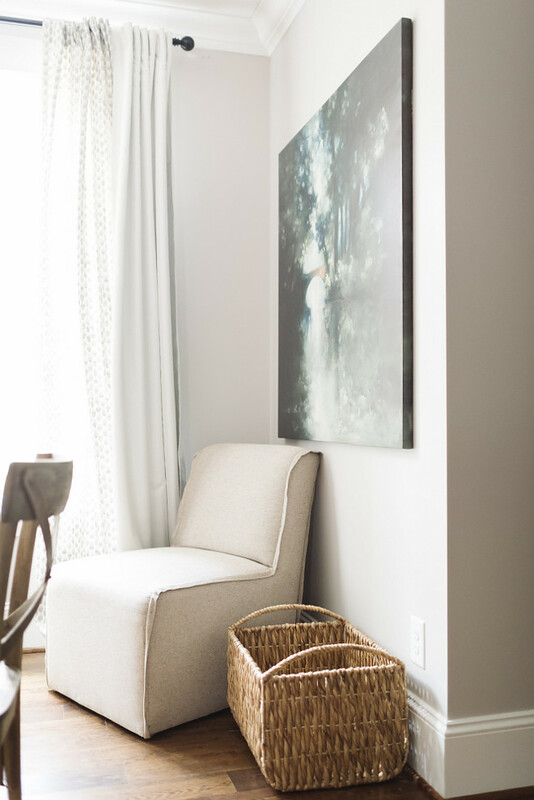 We have plans to add cabinetry here, but for now we love how this space functions! The large scale art creates the base for most of the colors in these 3 spaces. I pull from it all the time! 8ft Concrete Pedestal Table: Local furniture shop. Dining Fixture: Venn 6-light Drum Chandelier (Brushed Nickel). Chairs : World Market French Bistro. Hardwood floors: “Horizon Forest” – 5″ rough milled white oak, water popped with dark walnut stain. We love all the swirls and knots they feature. 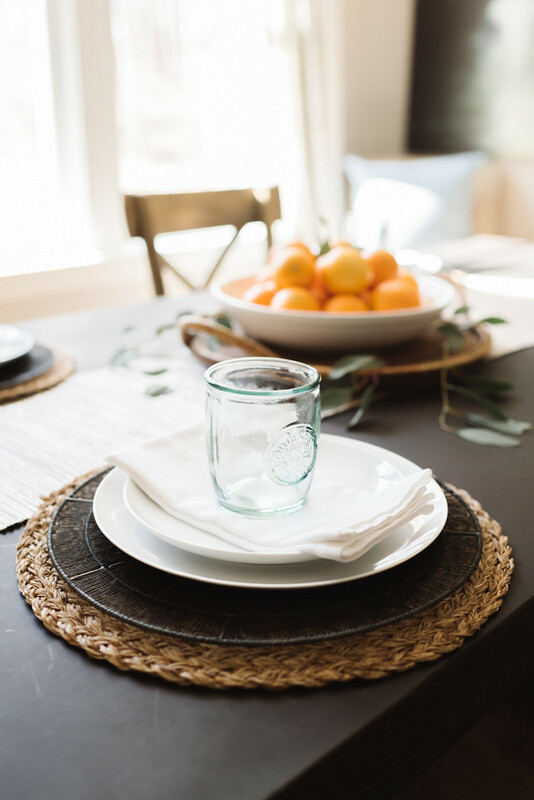 Table Runner: World Market placemats...that my mom and I hot-glued together…It’s hard to find inexpensive runners that fit an 8ft table, so I made one. 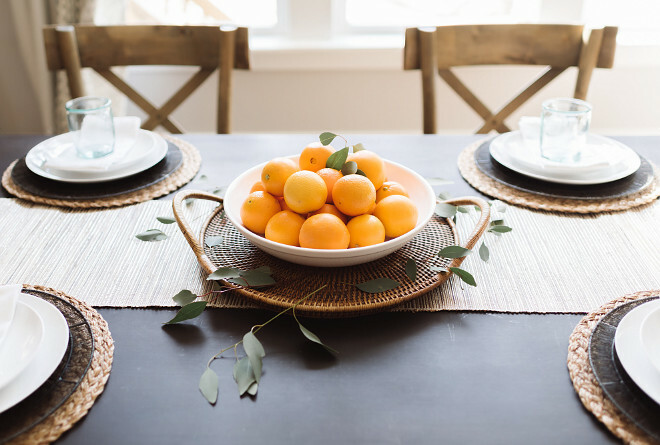 Place Settings: Crate and Barrel. Wall paint color is Mount Etna by Sherwin Williams. Bar tray is Home Goods with vintage decanters. Isn’t it a great spot to slow down and read a good book? Curtains are from West Elm. This space is what you see when you enter our foyer. 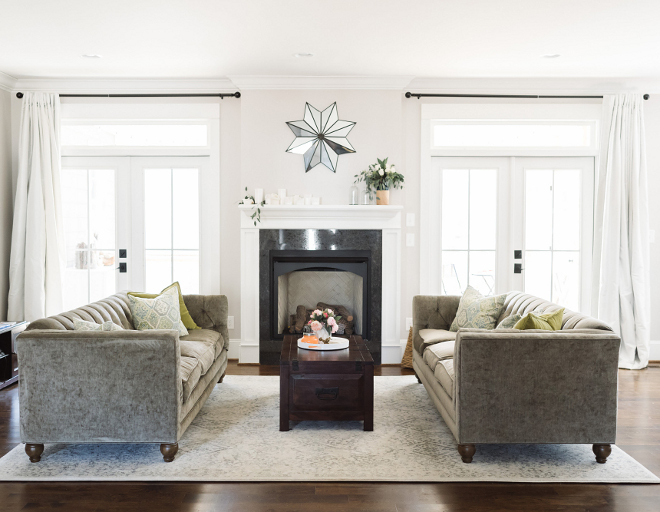 Symmetrical tufted sofas, french doors, and a fireplace. 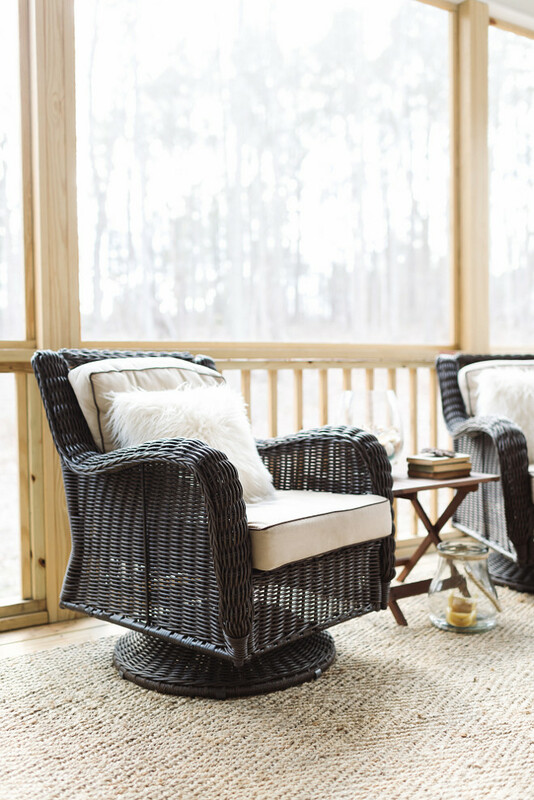 We love having the doors open during the warmer months to create an even larger entertaining space with the screened porch. 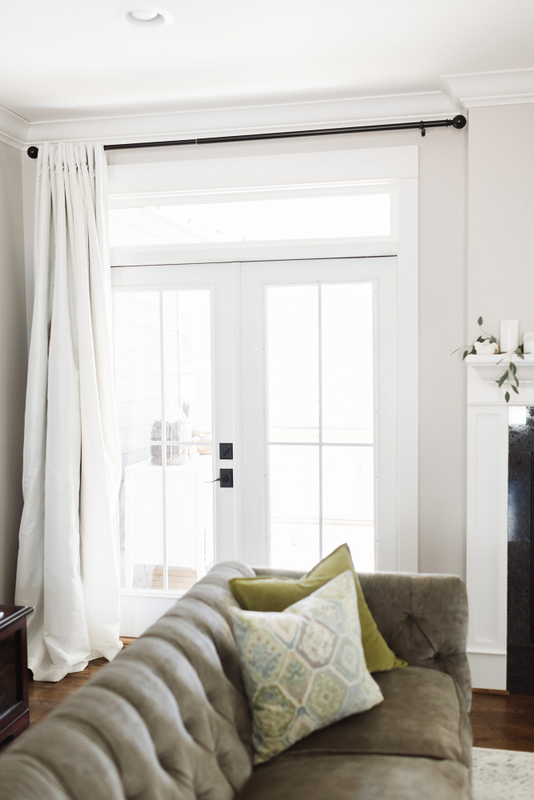 Puddled curtains help keep the space warm in the winter and cool in the summer. Sofas: Stevens 92″ by Robin Bruce. Rug: Rugs USA – Bosphorus Floral Ornament Ivory 9×12. Abbie brings beauty to her home in subtle ways. Mirror is from Target and candles are Capri Blue Volcano. Our trunk coffee table stores games and blankets. 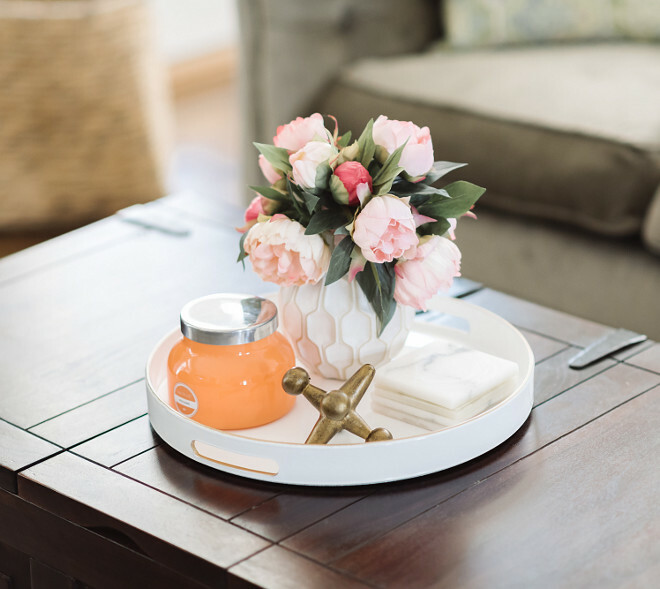 Coffee Table: Crate and Barrel. Draperies are from West Elm. I love them! Pillows: Chartreuse Velvet – Pottery Barn ; Printed – Home Goods. When we are out on the porch, it feels like we are in a tree house. Watching a summer storm come in is one of our favorite things. We have cafe string lights and a little table to eat out here too. Bronx (our dog) especially loves to be out here. Swivel Chairs & Furry Pillows: At Home. This is one of my most eclectic spaces as it holds various treasures that I find in nature. 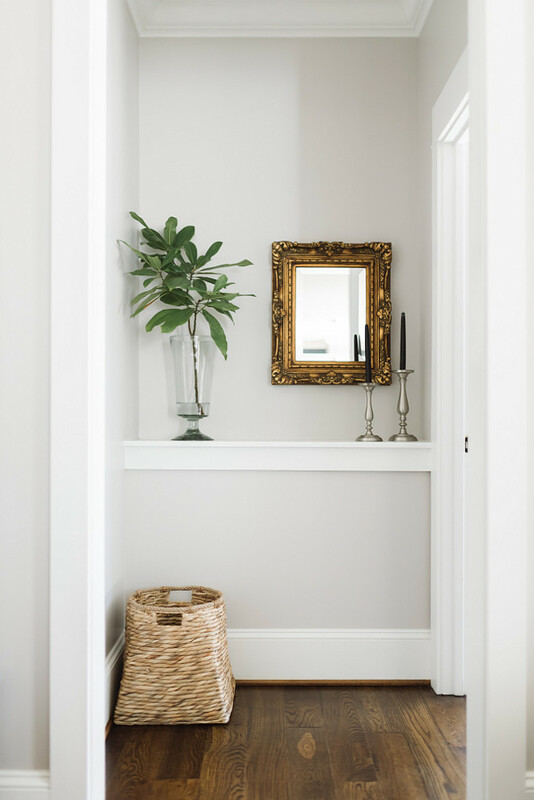 Trim Paint Color: This trim color works very well with any wall paint color; “Snowbound by Sherwin Williams”. 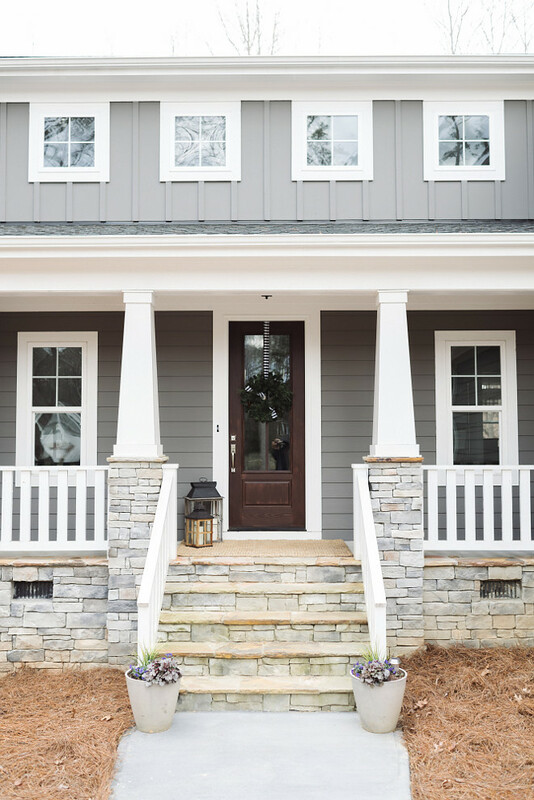 Trim Details: Trim profiles were custom selections with a local millwork company. Crown is 6 inches and base is 8 inches. Door/window profiles are 4 inch straight with a 6 inch header and bead in between. Our master ensuite is our personal retreat complete with a vaulted ceiling and tall windows. 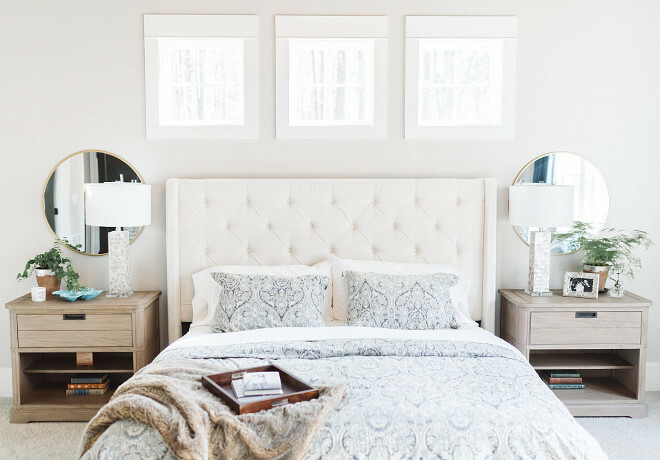 Three square transom windows create a headboard over the master bed and a big fluffy bed completes the nest. 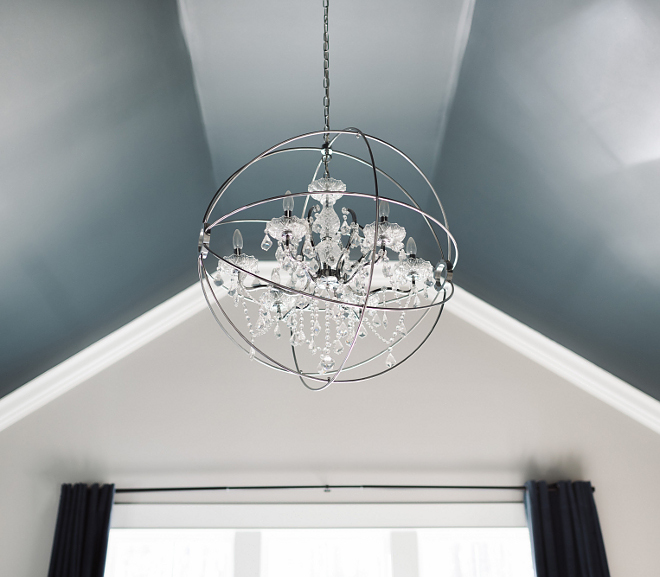 We chose to paint the ceiling dark to create a stunning backdrop for the chandelier. Ceiling paint color is Mount Etna SW7625 Sherwin Williams. The bedding and curtains pull in the deep blue tones from the ceiling and help anchor the room. I discovered this year that I loved putting the main Christmas tree in here, it makes such a statement. Bedroom chandelier is Warehouse of Tiffany – Saturn’s Ring 32″ orb chandelier from Overstock. Sheets: Bed, Bath & Beyond. Duvet & Shams: Pottery Barn Mackenna in Blue. 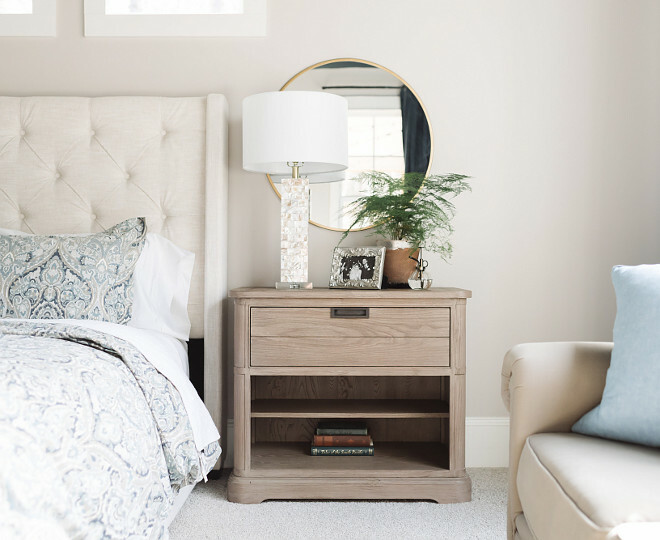 Dresser & Bed Tables: Bassett Artisanal. 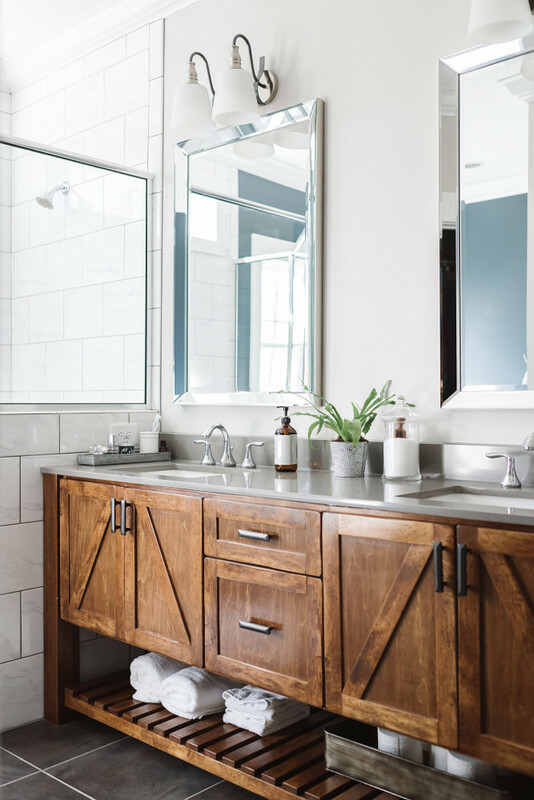 We kept our tile, grout, and counter selections simple since we wanted the focus of the space to be the vanity that we built. 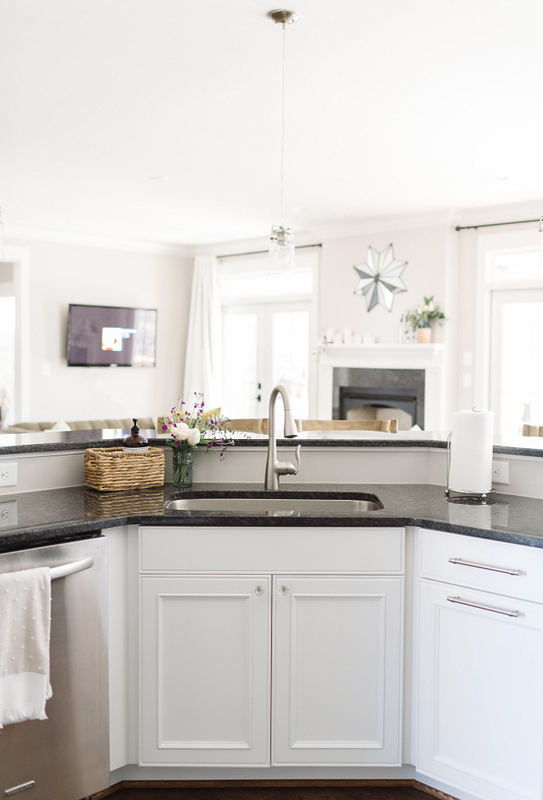 Master Bathroom Countertop & Tub Surround: Silestone Quartz – Gray Expo. Bath Floor Tiles: Emser Napa Nero 18×18. Lighting: Jeremiah Preston Hollow 2-Light. 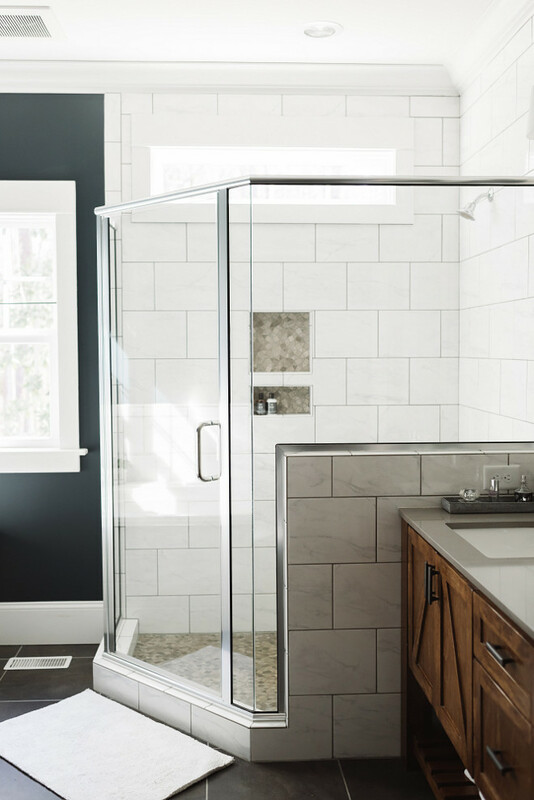 The semi-frameless glass shower and transom window lets light flood the rest of the bathroom. Shower Floor & Niche Mosaic: Emser Metro Gray Geometric. Bathroom Wall Tiles: Lowe’s American Olean Mooreland Carrara White Ceramic 9×12. 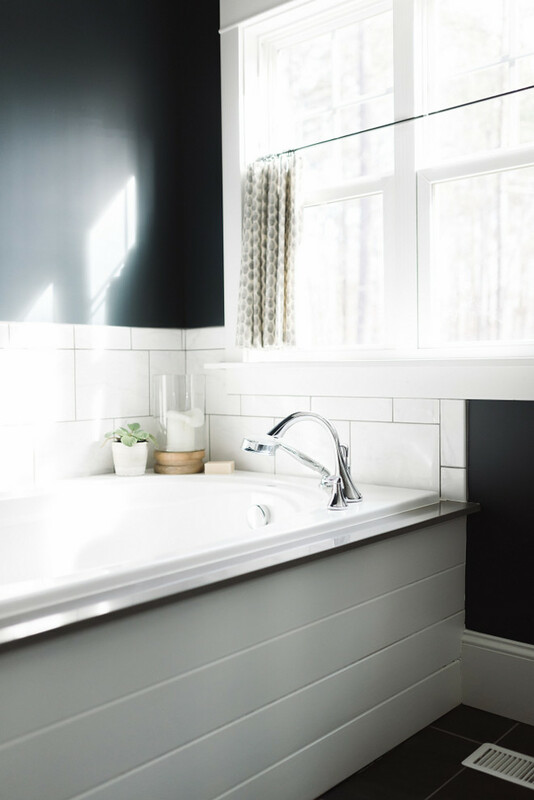 I did pull in the same dark wall color into my tub space – it reflects candle light beautifully! The front of the tub also features tongue/groove planks to reflect trim in other areas of our home. White and glass accessories complete the room. 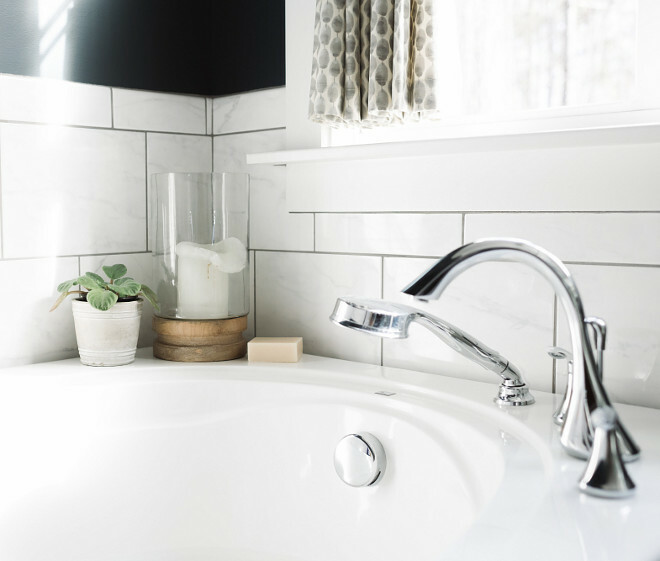 Tub faucet is by Moen. We designed/built our master vanity out of maple and stained it in Minwax Early American. We used the same tongue/groove planks to keep trim elements cohesive throughout. This is the hardest working room in the house. It connects directly to the laundry (which is our next big project – hah!) and the staircase to go upstairs. The dog treat jar is obviously the most important thing here. 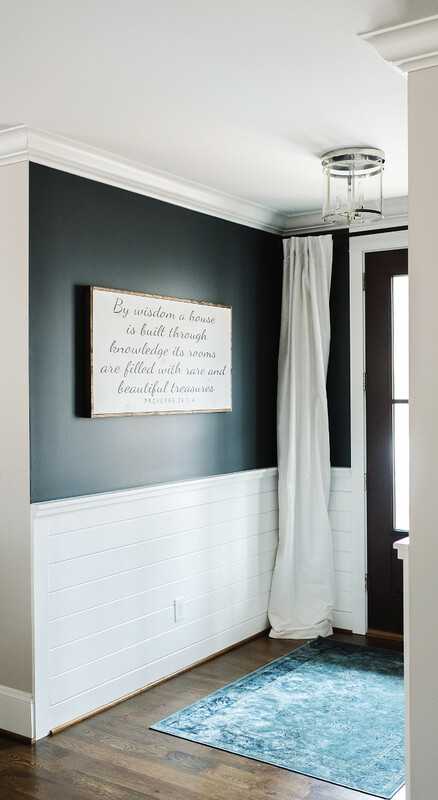 I am so grateful to my dear friend, Kelsey Nelson, for taking these incredible photographs of our home. She captured exactly how we view our home. Kelsey is a wedding photographer who also does lifestyle shoots. 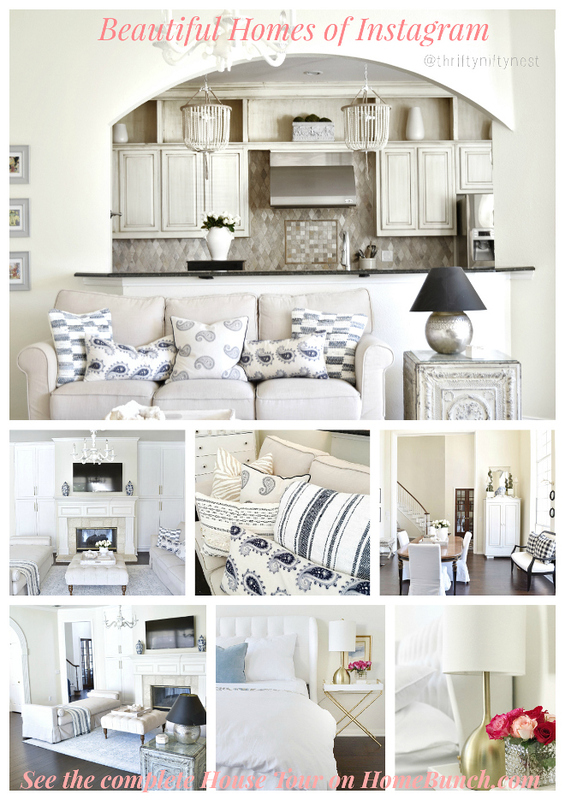 Interiors: “ The Gray Cottage“. 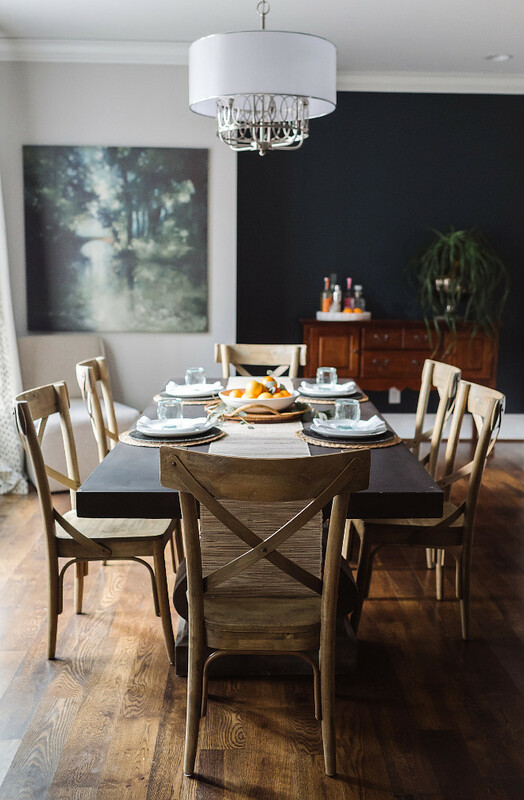 Make sure to follow Abbie from @thegraycottage on Instagram to see more photos of her beautiful home! I want to thank Abbie for working so hard on this and for sharing all the sources with us. Isn’t her home stunning? I love the quality of the photos as well. Just beautiful! Are you guys watching the Grammys? I have always loved Adele and I have to say that I love her even more now… keeping it real and honest is always the best way to go! I hope you have a Blessed and Healthy week. Thank you all for being here today… what a gift! Hi, I was wondering if the whole exterior was SW Gauntlet Gray or if the board and batten at the top was a lighter shade? Thanks so much!